But the one thing I love most about smoothies?? I can pack a whole lotta nutrition into 1 cup! Chia, hemp, or flax seeds, grass-fed collagen, antioxidant-rich berries, greens, spirulina, adaptogens like maca… the sky's the limit! 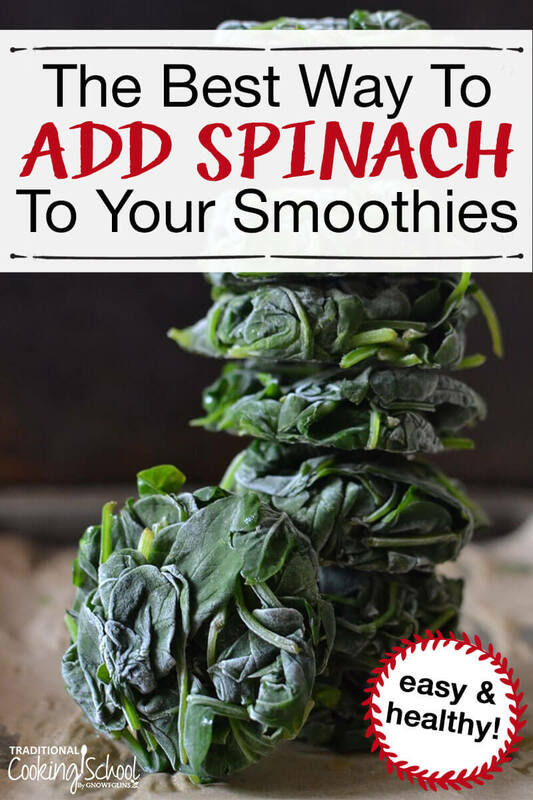 Spinach is one power-packed green veggie that I love adding to smoothies. Unlike kale, which tends to be bitter, spinach has a pretty neutral flavor and doesn't take away from the sweetness of my smoothie. If spinach is so great, why go to the trouble of making spinach smoothie “pucks”? Well, as nutrient-dense as spinach is, there's also a problem: oxalic acid/oxalates. And spinach has lots of 'em. Oxalates/oxalic acid are to spinach what phytates/phytic acid are to beans, grains, and seeds that haven't been traditionally prepared through soaking, sprouting, or sourdough. They interfere with mineral absorption by binding to the minerals in the food and preventing absorption. Calcium is the particular mineral that the body can't absorb because of oxalates/oxalic acid in raw spinach. “[A]lthough the calcium in spinach is 115 mg per half cup cooked, because of the interference of oxalic acid, you would have to eat more than 16 cups of raw or more than eight cups of cooked spinach to get the amount of calcium available in one cup of yogurt” (source). What's the point in eating calcium-rich spinach if your body can't absorb the calcium?! Because steaming spinach each and every time you want a smoothie is a pain, these Steamed Spinach Smoothie “Pucks” are super convenient! Plus, 1/3 cup of steamed spinach = approximately 1 full cup of raw spinach! When you're ready to make a smoothie or my favorite Hippie Juice, you'll have pre-steamed spinach that's low in oxalates and much better for you than raw spinach! Spinach is one power-packed veggie that I love adding to regular and green smoothies. There's just 1 problem: spinach has lots of oxalates. Here's how to lower oxalates and use spinach in smoothies without steaming it every time. Line cookie sheet with unbleached parchment paper. Prepare to steam the spinach. I do not have a special steamer or steaming basket. I simply place a stainless steel colander inside of a larger pot with a bit of boiling water in the bottom. Nothing fancy, but it works! 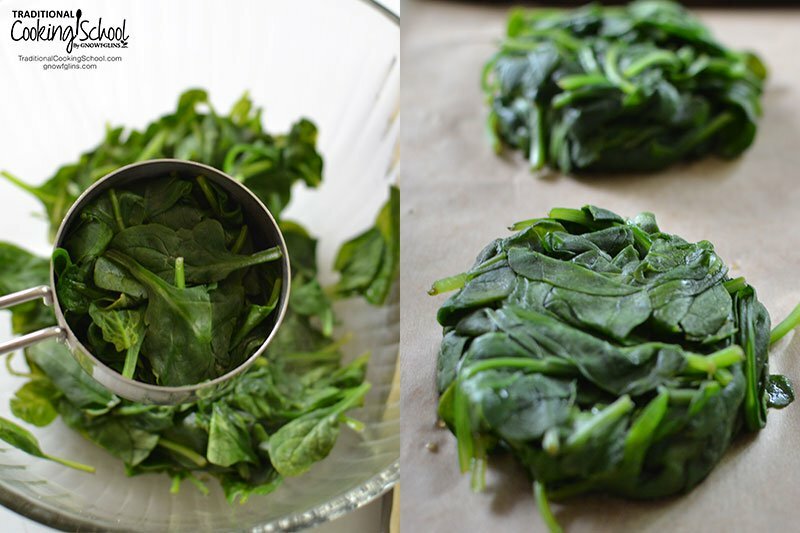 Place as much spinach as will fit into your steamer (or pot + colander over boiling water). Cover the spinach and steam for 1 minute. Pack the steamed spinach into the measuring cup. Flip it over and give it a tap onto the parchment-lined cookie sheet. It should come out the same size and shape as the measuring cup. Continue to do this until all the spinach has been used. Freeze 4 to 6 hours, or until the spinach is in solid "pucks". Store in a zip-top bag in the freezer. Add 1 smoothie puck to any smoothie for a boost of good-for-you greens with lots of absorbable calcium! Green smoothies are healthy — as long as you're not adding handfuls of raw greens to them. Spinach isn't the only green veggie that's high in oxalates either. Swiss chard, kale, and beet greens also contain high amounts of oxalic acid. Use this same method for those greens, if you have an abundance that you'd like to add to your smoothies. Do like spinach in smoothies? Have you ever thought about steaming ahead? Would you like to try these Steamed Spinach Smoothie “Pucks”? Brilliant! Thanks, Lindsey, for this excellent tip. I’ve got spinach on the grocery list. I see green smoothies in my future. Have a blessed weekend! Sure thing! Enjoy your low-oxalate smoothies! That is truly Brilliant! Love it! I’ve been steaming my greens for a wile now but didn’t think to make pucks. I like to add steamed greens to soups, taco filling, just about anything. Thanks for the puck idea. ???? Won’t steaming it affect the taste of the spinach and in turn the smoothie? “Cooked” spinach has such a different flavor than raw spinach. I would love to absorb calcium, but I don’t really want to taste the spinach if you know what I mean. I was hoping to find something about this recently. Some folks were complaining about heating raw veggie’s for smoothies though because of how heat destroys the vitamins? Is that accurate? Would 1 minute of steaming have much of an affect? The 1 minute of steaming time dramatically lowers oxalates, but doesn’t cook the spinach to death, which would result in a loss of vitamins. Do you think that frozen spinach which is blanched would give the same benefit? I’d like not add another task to my already busy kitchen-time! I understand! If you’re sure your frozen spinach was blanched prior to freezing, then yes, it’s the same. However, the cost is more, especially for organic frozen spinach. Also, these “pucks” are just the right size for adding to smoothies. No breaking apart a brick of spinach just to toss into the blender! Really great information. I’ve read about oxalates and stopped putting them in my smoothies. I thought about cooking them and that didn’t sound appealing. Thanks for posting the best way to get greens into our smoothies. I’m planning on figuring out how to steam greens in my Instant Pot! I stopped putting greens in my smoothies for this reason awhile ago. What a great idea to portion out pre-steamed greens like that! I can see greens are going to make a comeback in my smoothies now! That’s great, Emily! Glad this was helpful! I have never heard of this! So I guess we shouldn’t be eating raw spinach salads either? I have always heard that spinach was one of the best raw greens to eat. This is the first I’ve heard it’s not. Ideally, no. A raw spinach salad a couple of times a month probably isn’t going to hurt you (unless you know oxalates or kidney stones are an issue — in which case you should avoid raw spinach completely!). But there are people who make green smoothies on a daily basis with raw spinach, and that’s a problem. If a daily green smoothie is part of your lifestyle, I highly recommend making these “pucks” for best results. What about other greens? Kale and collareds? My coconut milk is just grinding the shreds with water in the blender for 3 min (no straining, I like coconut) then adding greens and grinding for 3 min more. Now I wont be grinding the greens as theyll be the pucks. Cool. This method may be a bit more work, but it will also keep the spinach from going “off” in the refrigerator if I don’t use it fast enough! Exactly! It’s a great way to keep expensive organic spinach from going to waste! Wouldn’t using frozen spinach from the grocery store work just as well? It is blanched before it’s frozen. I’m thinking we don’t really know how the frozen spinach is prepped. It may be cooked to death before it’s packaged for the freezer section. Typically green foods turn sort of grey-ish or brown-ish when they’re overcooked (think canned green beans or canned spinach). Frozen spinach, in my experience, is quite bright green. However, we don’t know if it is blanched or steamed prior to freezing. 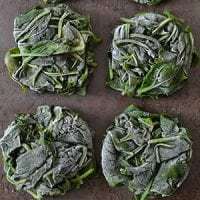 Further, even if it is blanched or steamed, frozen organic spinach is not cheap, and therefore, steaming and freezing yourself is a much more economical option. I think i ll try this with the other greens i want in my shakes too, kale, chard, etc. Maybe chiffonade them first so they quick cook. They take awhile to cook. Baby greens r quite good in shakes too. Do these contain as much oxalates as the mature leaves? It’s very possible that your kidney stone was the result of too many oxalates from raw greens, Kim. 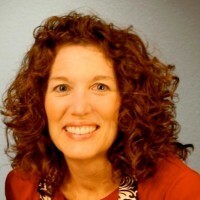 Hope this works better for you! Thanks for the info. I knew we shouldn’t eat a lot of oxylates, but didn’t know why! We juice carrots with spinach on a daily basis with a Champion juicer. Does juicing make any difference rather than blending in a smoothie? I guess we could juice the steamed spinach or kale. But it is one more step I’d like not to do! Thanks for your information and suggestions. I personally think eating the whole food is better than the juice. Not only is it more economical (you’d have to juice A LOT of spinach! ), you’re getting the fiber as well as the enzymes and benefits of the juice. I think the question was about the oxalate levels in juiced spinach as compared with whole fresh leaves. I don’t know for sure, but I would assume the oxalic acid would be the same either way? Raw spinach in any form in high in oxalic acid. Plus, spinach isn’t efficient for juicing. It takes an enormous amount of spinach to produce a very small amount of juice. Great idea! But please no plastic bags for storage. They last for hundred of years, and, among other problems, they break down into small pieces and are eaten by birds and sea life. I use the same bag over and over, rather than pulling out a new bag every time I make my smoothie pucks. I agree that plastic bags are a bad choice for the environment and the planet, however sometimes they are the most convenient thing. I just choose to wash and re-use whenever possible and recycle when I can’t re-use. Is cooking spinach by sautéing or adding it to a boiling liquid the same as steaming it in terms of oxalate reduction? Any cooking method will reduce oxalates, however a quick steaming is the most effective method to reduce oxalates while maintaining high levels of vitamins and minerals. Ok, so I was wondering what dehydrating does as far as oxalates is concerned. I dehydrate mine and add that to my smoothies. When you dehydrate, you use heat, so does that reduce the oxalate? This is exactly what my doctor suggested since I told her about my digestive issues with green smoothies. Not the puck part, but steaming the greens prior. Such a great idea, thank you. I sometimes purée the spinach and freeze in cubes. Is there any reason the pucks are better? Or just buy frozen spinach from your favorite grocery store. It’s blanched before freezing so it will have oxalates removed/reduced just like this process, and pathogens killed. Never heard acid reduces oxalates.